KILALE, ANDREW M.; KIMARO, GODFATHER D.; KAHWA, AMOS M.; CHILAGWILE, MABUBA; NGOWI, BERNARD J.; MULLER, WILLIAM; CHANDE, HASSAN; MFINANGA, GODFREY S. & HINDERAKER, SVEN G.
The primary aims of tuberculosis (TB) control programmes is early diagnosis and prompt treatment of infectious cases to limit transmission. Failure to diagnose and adequately treat TB could lead to premature death and unrecognized transmission of Mycobacterium tuberculosis . 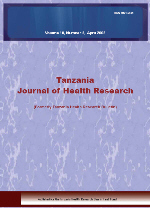 The proportion of missed TB cases has not been reported in Tanzania. The objective of this study was to quantify the number of cases of TB identified by autopsy. Deceased morbid bodies from Muhimbili National Hospital were involved. Retrieval of admission, diagnostic and other important records used to manage the patient after admission was done. Demographic information, site and type of disease, past medical history, chest x-ray report, clinical diagnosis and cause of death reported upon death certification were recorded. Lung tissues, lymphnodes and blood clots for HIV testing were collected. Biopsy tissues were processed through Ziehl Nielsen staining and examined by microscopy. The study involved 74 deceased individuals where 56 (75.7%) were males. Information for duration of seeking health care before death was available for 41(55.4%) subjects. Thirty-four (45.9%) cases received diagnosis before death. The main diagnoses were pneumonia 10(13.5%), heart failure 6(8.1%), AIDS-related illnesses 6 (6.8%) and malaria 5 (6.8%). The main clinical findings were wasting (51/74 (68.9%)) and abnormal fluid collection in different body cavities, 61(50.8%). In 24 out of 71(33.8%) biopsies acid fast bacilli (AFB) were detected. Records of lymphnodes examination were available in 63 cases and 22 of them had AFB. Twenty-two (34.9%) from the paratracheal and hilar lymphnodes were observed to have AFB. HIV was detected by ELISA in 19 (33.3%) out of 57 deceased, and 12 (63.2%) of the HIV positive deceased were co-infected with TB. Out of the 22 cases positive for AFB on tissue-biopsies 12 (54.5%) were HIV positive. There is a high number of TB cases diagnosed after death that could not be detected before they died. There is a need for increased awareness and to include postmortem data in the annual statistics of TB for precise reporting of the magnitude of the TB burden in the country.